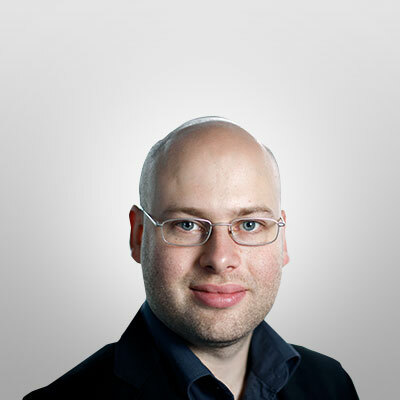 Isobar > The Squeeze >Ideas>Is Digital Data a Crystal Ball for the Future of Automotive? Getting your digital house in shape should be the first order of business for any brand in the modern world…so says our Digital Strength Index (DSI), at least, which tracks billions of digital data points generated by brands and the people using them. Whether you choose to agree with the billion proof points or not, we’ll leave up to you. The data that powers the DSI is an extremely reliable indicator of business growth. In fact, it is used as a data source for many investment funds. The automotive space is one of the most seriously disrupted industry verticals today, bringing uncertainty to Detroit and beyond. 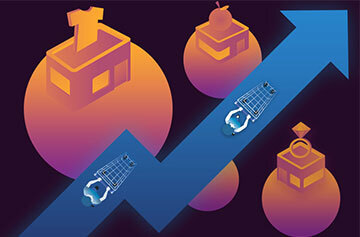 Rapidly shifting consumer tastes have influenced the demise of the sedan; Millennials’ lack of spending power has caused the market eroded from below; technology threatens established marques with automation and electric vehicles; and increased urbanization and the sharing economy have chipped away at the need to buy. 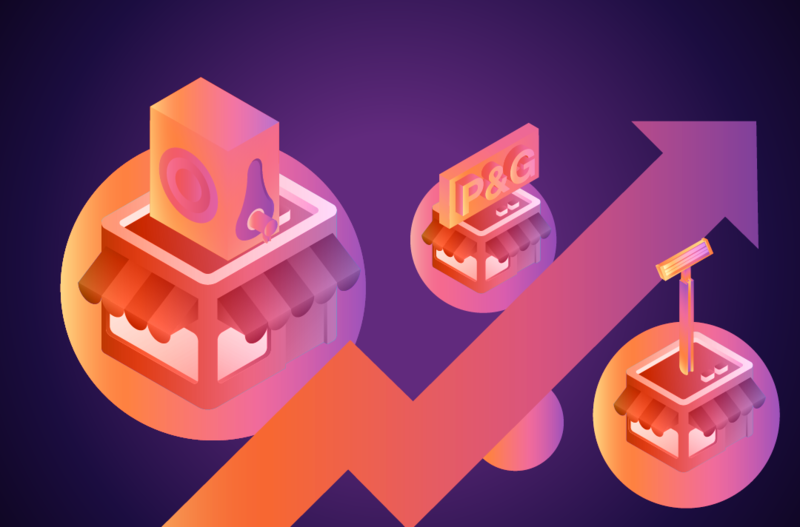 While all of this we know (and have known, for quite some time), we wanted to use the DSI to quantify how far these trends have grown and to point to the future of this dynamic category. 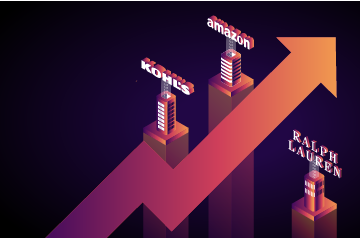 So, we took four of the most prominent industry upstarts and looked at what their digital performance might have to say about their future growth. Digital Momentum captures the strength of incoming customer interactions – de-seasonalized to tease out who is really experiencing true changes in acceleration. First up, we’ve noticed big variations in rates of growth between our disruptors. Lyft is our top performer overall, by a significant margin, and has managed sustained these metrics for most of the past two years. This performance has preceded recent announcements on revenues and share, with Lyft’s CFO announcing in May that they now held 35% of the US ride-sharing market. It’s perhaps surprising that the laggard in Momentum is Uber – or is it? What does it mean when a business with a consistently aggressive growth strategy fails to match its competitors? Has Uber reached a natural saturation point? Or are they suffering the hangover from #deleteuber and the other numerous controversies that have dogged them over the past couple of years? Research around the time of #deleteuber from management consultancy cg24 suggested the switch-rate to Lyft was only around 4%, but the digital data suggests that may now be an underestimate. Is Uber tuning out a younger growth base? Perhaps one of the reasons Uber is lacking in momentum is the polarized age group they seem to draw on. The above comparison of age groups using each brand could not be more different. To note, we’ve been careful to exclude youth-biased brand extensions, such as Uber Eats, from the analysis so we can accurately compare the ride-share offerings. In 2019, the penetration of smartphones in the US will cease to rise, topping out at around 75%. 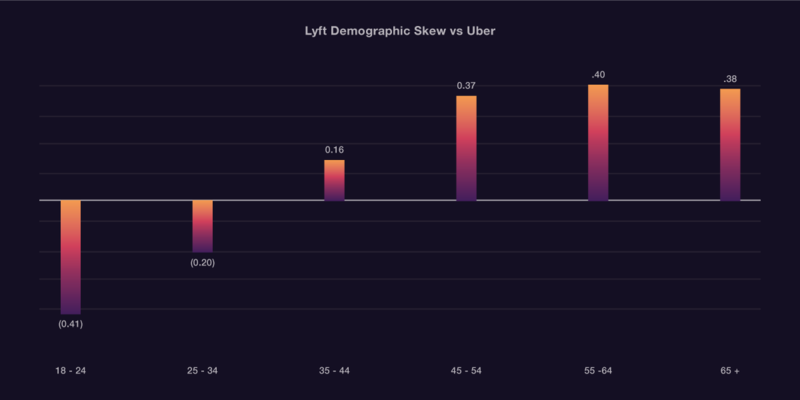 Establishing a beachhead in the younger demographic makes sense strategically and, with this in mind, Lyft’s less corporate vibe, less aggressive market positioning and frequent charitable initiatives, take on a new light as targeted PR. 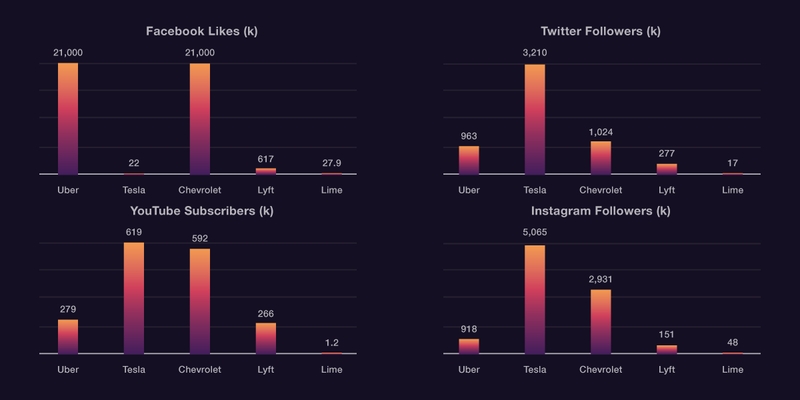 With Tesla performing so strongly among disruptors, it’s well worth examining how they play in digital strength against mainstream car manufacturers. 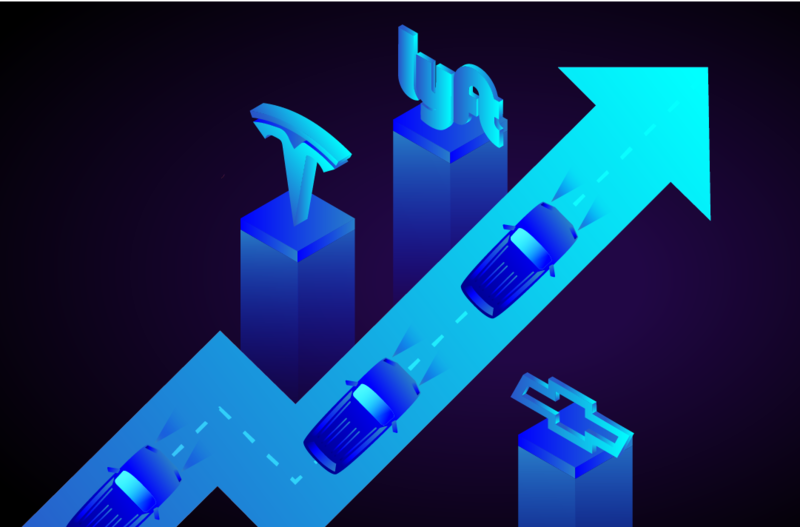 According to the data, Tesla is far outstripping its usual Disruptor tag and has officially joined the mainstream — as far as US consumers are concerned. 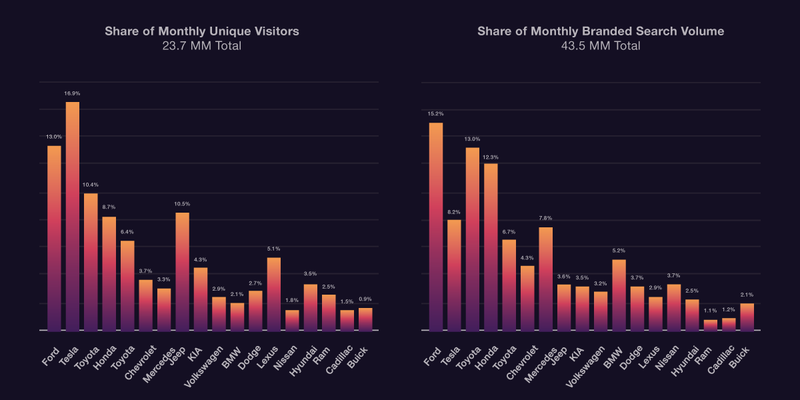 Incredibly, Tesla, despite limited market reach, is already tracking around 30% ahead of any global competitor in terms of total unique visitors and is doing so without needing to rely on Search to bring in users. While Tesla’s momentum is impressive, the company is no longer simply building on a small early-adopter base. When it comes to digital, Tesla is way ahead of most mainstream car brands. This proficiency at driving digital traffic in advance of sales, and to an order of magnitude beyond its expected volume sales, contributed to the hyper-successful launch of the Tesla Model 3. Despite its high price point, the Model 3 was the #5 in unit sales and #1 in revenue in July and August last year. Although only deployed in a few cities, and with about a decade disadvantage on our other players, Lime may be about to disrupt the disruptors. 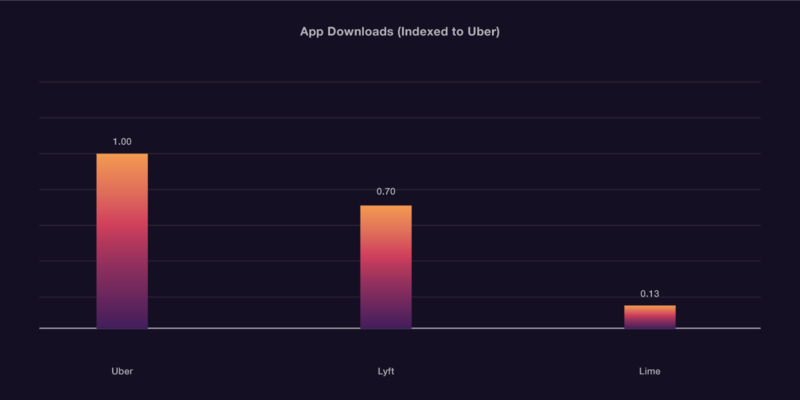 Lime has not been around long enough for us to get a Momentum reading, but just from their existing US launch cities, they are already delivering around 20% of Lyft’s new app installs. This level of penetration without huge associated advertising spend indicates that, if the model continues to scale efficiently, there is great potential for shifting the shape of urban transit. In upcoming quarters, we’ll keep an eye on Lime and its competitors’ digital metrics to see how this dynamic new sector shakes out. We have a full data set on digital strength in the automotive sector that we will report on here in the next couple of weeks.